Massage the kale with a tablespoon of olive oil and a pinch of kosher salt for five minutes or until the leaves begin to wilt. Toast quinoa in saucepan over medium high heat, stirring frequently until quinoa is very fragrant and smells nutty (5-7 minutes). Season with a pinch of kosher salt and cracked pepper. Next add chicken stock and bring to a simmer, cover and reduce heat to low and simmer for 18-20 minutes or until liquid is absorbed. stirring once halfway through cooking. 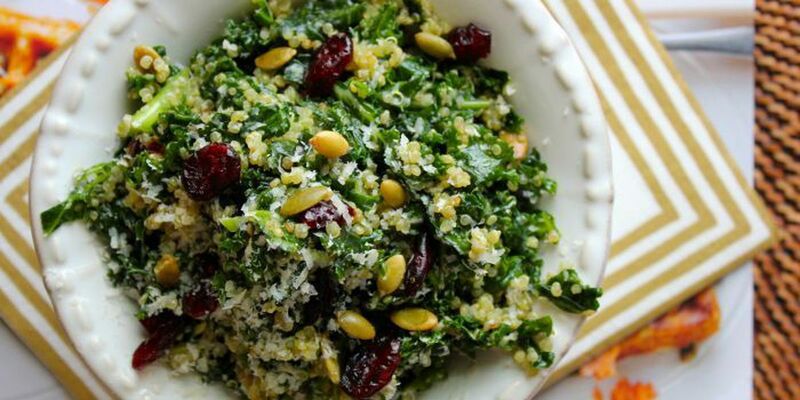 Remove pan from heat and stir in cranberries, kale, pumpkin seeds, Parmesan and 5-6 tablespoons of vinaigrette.